Welcome to the second part of the Ultimate Golden Image Automation Guide. The goal is still to create a new Golden Image by scheduling just one deployment Run book without extra manual tasks. This Guide will be in three parts, the first part is Preparation – Citrix Provisioning Services and Ivanti/RES ONE Automation. 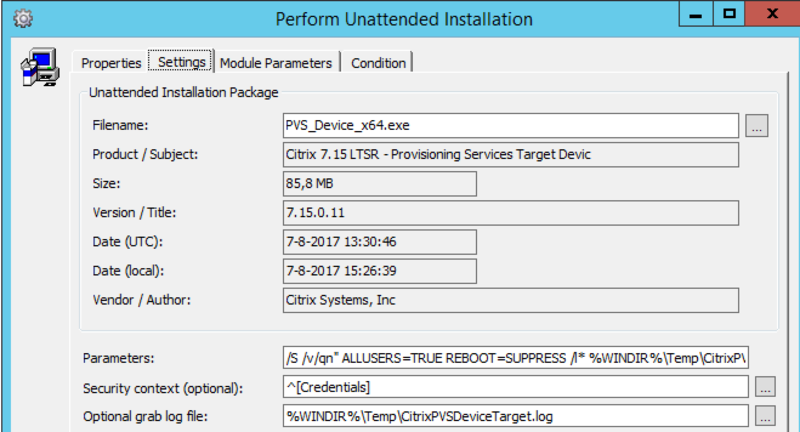 The second part is Deploying software – Ivanti / RES ONE software, Citrix VDA, Citrix PVS Target Device and Middleware. The third part is Optimzing/Sealing and Imaging vDisk – BIS-F sealing script and VMware OS optimization tool. We’re going to make each category into its own Project. And finally add them to the Deployment Run book. The middleware we’re going to put in the Golden Image will be .NET 3, .NEt 4.7, Adobe Flash, Java and Silverlight. We then finish the project with a Reboot. 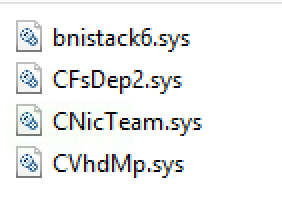 The folder we specify after source needs to have the “microsoft-windows-netfx3-ondemand-package.cab” file. You can find this file in the ISO of the Windows installation media in the folder Sources\sxs. 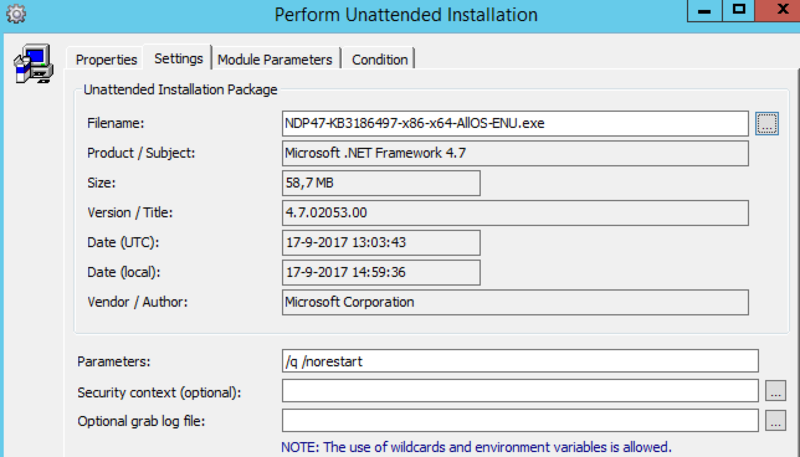 We’re going to deploy .NET4.7 with a Unattended Installation Task. First we’re going to download the .net 4.7 offline installation file from Microsoft here. 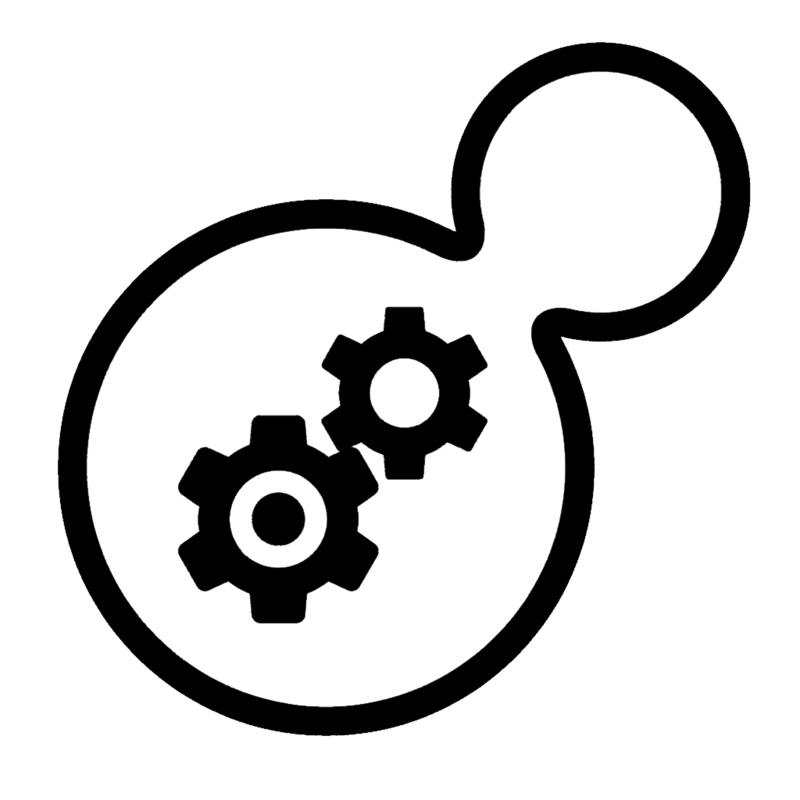 Now we need to add the installer to the Automation Resources. I always use a linked resource to a File share, this saves space in the Database. 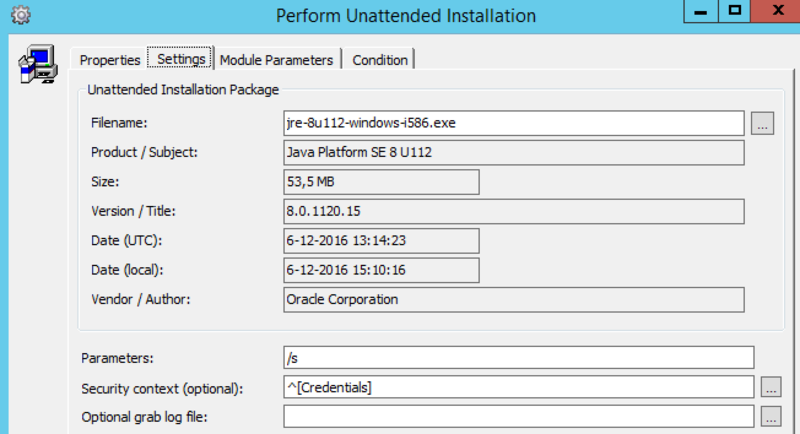 After the installation we add a Postpone job for 3 minutes so that the target VM can finish the .NET optimizations. After that we add a Reboot. Because we use Windows 2016 we only need to Install the Adobe Flash plugin and not the Active-X component. We need to download the offline flash installer from Adobe here. Now we need to add the installer to an Automation Resource. After that we need to create a Windows Installer Package task and select the Adobe Flash resource. We don’t need to set extra parameters. We are going to download the latest Java release from Oracle here. After that we add the installer .Exe to the Automation resources. 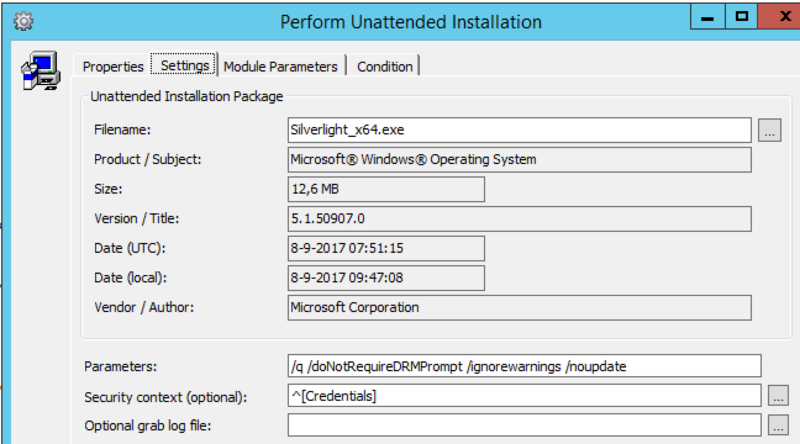 Now we create an Unattended Installation Task and we set the /s switch for silent install. Now we just need to add all these modules to a new Project, named 02.00.00 Deploy Middleware. Microsoft Office 365, /Configure “install.xml” create your XML with this awesome Click-To-Run Configuration XML editor on GitHub. Now add all the modules to a new Project and name it 02.00.01 Deploy Software. We’re also going to add a Reboot task as a last task. Now we’re going to create modules and a Project for the last category of applications. These are Management Tools, applications we need to lock down the desktop and make the desktop available to the user. We’re going to install the Identity Directory Client from the RES Success center here. After that we are going to add the .MSI to an Automation Resource. After that we create an Install Windows Package task and select the MSI. 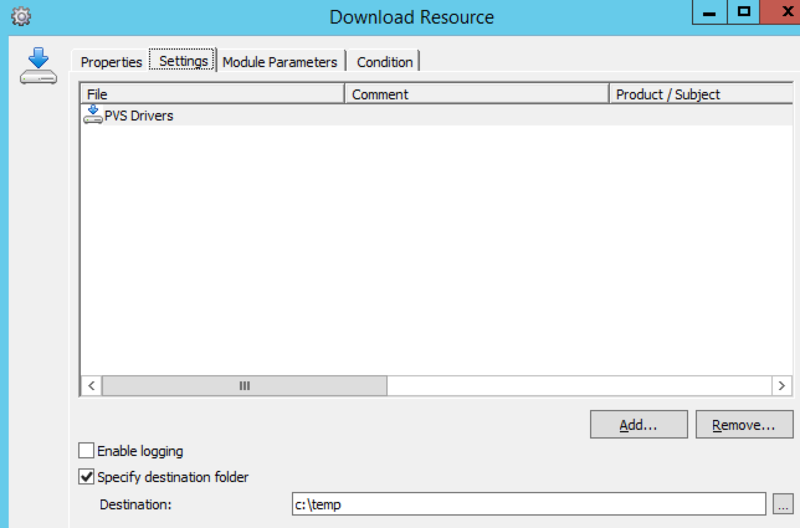 At module parameters you can fill in the correct settings for your environment. You can download a complete RES ONE Workspace installation Module from the RES Hub here this module is created by Rob Aarts. The module comes with handy parameters and registry settings. Because I use a service account for my RES ONE Workspace Agent I added a task to add my service account to the local administrators. After the installation I added a task to change the RES Workspace Agent Service to run with the service account. You can find all silent installation parameters here. After every vcredist installation we add a 10 Second postpone job and we finish with a Reboot. 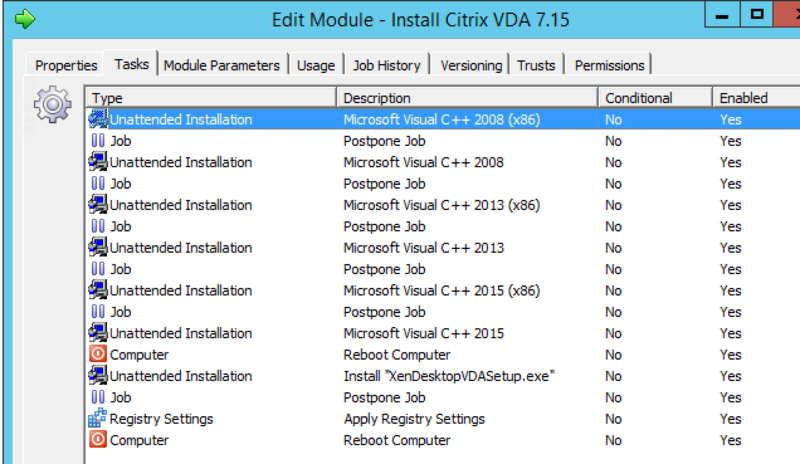 Now we’re ready to start the installation of the XenDesktopVDA.exe installation. First we need to link the .exe to an Automation resource. 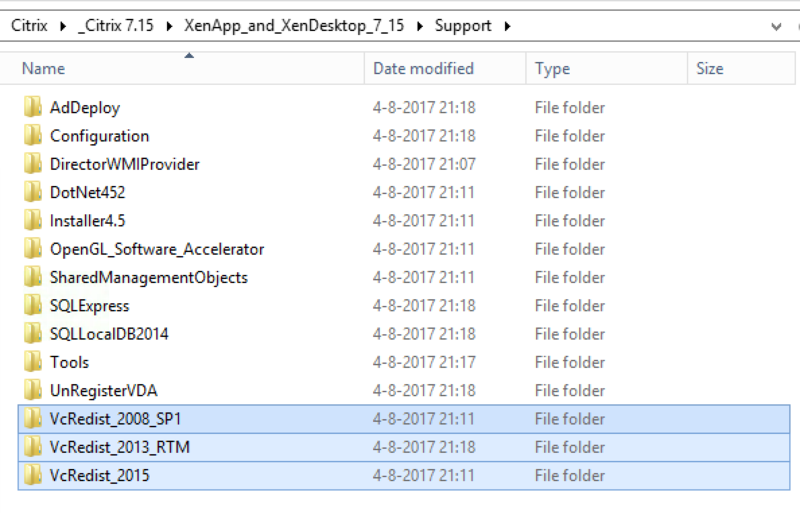 You can find the installer on the XenDesktop ISO in the folder x64 XenDesktop Setup. Of course you must add your own Delivery Controllers as the value of the ListOFDDCs . If you have multiple leave a blank space between them. Now we add another reboot and the module is done. We’re going to add a Reboot task and we’re done! 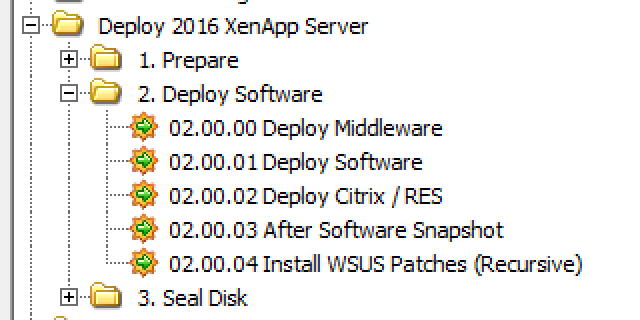 Add all the modules to a new Project and name it 02.00.02 Deploy Citrix RES. 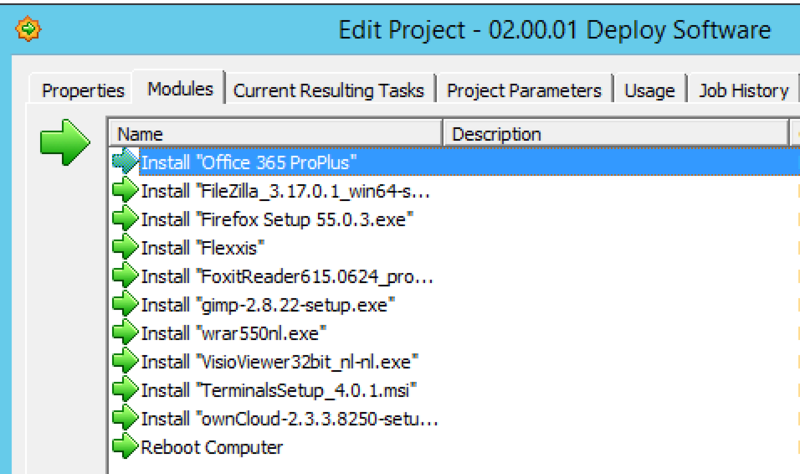 We already run this project but you can add it again to make sure the latest office patches are also included. This project will install the Windows Updates from the internet or your WSUS server. The project is created by Virtual Engine’s WSUS Integration Management Pack (WiMP) and you can download it here. A great thing about this project is that it will keep repeating itself until all patches are installed. For the deployment Runbook I copied the project that the WSUS integration pack from Virtual Engine made and added an extra reboot and extra scan. Now add the projects to the deployment Run book. Make sure that all the software projects use the RunBookWho parameter except the Snapshot project that needs to be run on an agent with PowerCLI installed. In this guide this is the DTNMGT01.